With over ten years of experience, Sarah has become one of the top choices for San Francisco brides-to-be. She has been able to achieve this reputation by caring completely about each client and adjusting her services to fit their needs exactly. 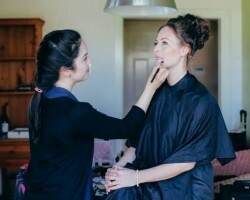 Sarah understands that bridal makeup should reflect the exact personality of each woman she works with and therefore has developed new techniques that keep her work as fresh and as flexible as possible. 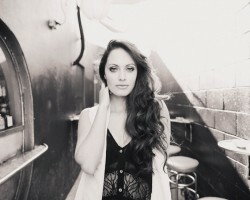 This artist offers on site hair styling and full makeup services in venues throughout the city. Kelly, the founder of Soyi Makeup & Hair, saw that there was a need for a quality makeup artist in California that also had competitive prices. With this straightforward approach to her work, Kelly has become a top choice in San Francisco and has worked on hundreds of brides throughout the world. Over this time, she has become known for creating beautifully timeless looks that will bring out the best of any bride. By using the best products and the latest techniques Kelly always achieves amazing results. There so many options when it comes time to decide on your bridal look ranging from which type of eyelashes to use to choosing between hairstyles. Lynn Yee is so much more than one of the leading San Francisco makeup artists as she is able to provide you with unbeatable advice and guidance through all of the choices. Lynn is a specialist in clean looks for brides that will last for much longer than other services in the area. Reviews of her work are only ever filled with praise for every part of the experience. It will only take a short time looking at Korina Stratton’s gallery of recent work to convince you that this is the best makeup artist in San Francisco, CA. 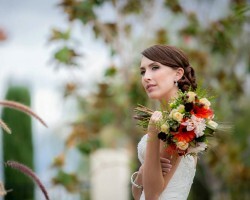 Her effects are always stunning but have a natural look that suits a range of wedding hair and makeup styles. On top of offering amazing results, Kornia also wants to bring her work to as many future brides as possible which is why she offers a clear list of affordable prices that can be worked into any budget. Tara Marshell has been providing brides throughout San Francisco and the surrounding area with her premium makeup services for many years. In addition to being one of the best in the city she is also ready to travel anywhere in the world, which means if you love Tara’s style you will be able to have this expert at your destination wedding. This professional has worked in every aspect of makeup and hair styling including commercial films, editorials, advertisements, short films, special FX set ups, boudoir shoots and has helped many brides look perfect.